Temple snakes licked Cassandra’s ears clean so that she was able to hear the future.Â However, Apollo placed a curse on her so that no one would ever believe her predictions. For me it’s not about hearing the future, it’s about seeing past and present, then adding 1 + 1 to come up with the 2 of the future. Although I hardly consider myself the Cassandra ofÂ epic tradition and tragedy, I do have times of frustration when I feel powerless and can’t quite understand how others can’t see what is so obvious to me. Of course, I am not alone in my observations. 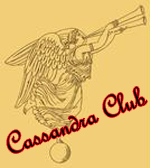 In fact it was suggested byÂ @NexusIndivulsus on Twitter to form a Cassandra Club. I’m betting ourÂ membership would be larger than anyone expected. Contrary to accusations, I had no axe to grind about Turkey before the Libyan Uprising. I had held Turkey as the model of a successful democracy in the Muslim world. It seemed liked a path that Egypt might follow – not exactly, of course – every democracy should be a homegrown hybrid of each country’s culture, demographics and needs. I watched on TV the large number of Turkish workers evacuated those first days of the revolt. I wasn’t aware there were so many Turks in Libya. In Â fact, I must admit, I was on the whole very surprised at the number of foreign workers there. Most Libyans were reported to live on <$2/day. I posed the question: Why aren’t Libyans doing these jobs? Why so many Turks, Chinese, Sub-Saharan Africans, and Egyptians? The Turks moved rapidly to get their citizens out. Lots of workers quickly evacuated = they weren’t there on their own. They weren’t migrant workers like the million or so Egyptians. Conclusion: Turkey must have a large commercial presence in Libya. Â I don’t think you have to be very smart to put that together. It wasn’t long before the dollar figures of Turkish contracts, especially construction, started coming out. Turkey had a huge financial stake in the Gaddafi regime. Next came the grumbling from Turkey about outside intervention. The grumbling grew to whispers of a veto for NATO action. The big multi-nation conference in London ended with a telling press conference with UK’s Prime Minister Cameron fawning over Turkey’s Prime Minister Erdogan. Cameron voiced his support for Turkey’s entrance into the EU. Erdogan almost glowered; his body language spoke volumes about repressed anger and resentment at diplomatic slights. Turkey had always been invited to EU summits, but as of late was left out. He made direct references to France’s obstruction of Turkish goals and spoke more about Cyprus than Libya. I did not see a man in a cooperative mood. I saw someone who was belligerent and resentful. But Turkey would not veto NATO action in Libya. The problem, it seemed to me, was that a veto wasn’t necessary to thwart the mission. Turkey could just insist on the strictest interpretation of UNSCR 1973, restricting the intervention to the bare minimum and thus allowing the superior forces of Gaddafi to prevail. Hillary Clinton in her London press conference looked, quite frankly, a little beat up. I couldn’t help but contrast her appearance with the glow of her speech in Paris just a week or so before when she hadÂ successfullyÂ put together theÂ coalitionÂ to slow the massacres of civilians by Gaddafi forces. The London presser showed a woman who had compromised far more than she desired. She had accepted the inevitable, but not happily. Next it was announced that Turkey would be in command of the naval blockade. This brought an immediate twist in my gut. Could Turkey, with its reluctant agreement to NATO action, be trusted with such an important mission? Supplies from abroad would come by sea. Effective strangling of Gaddafi forces depended on an effective blockade. I experienced a strong sense of dread when the transfer of US/UK/France operationsÂ to NATO approached. I tried to stay positive. I convinced myself that theÂ Coalition, having come this far, invested so much, used so much firepower, would not abandon theÂ necessityÂ of castrating Gaddafi’s military. Anyone could see that Gaddafi’s sons would not stop until they had crushed the civilian population, armed and unarmed. Wasn’t that obvious? The excuses started as soon as NATO took over. First it was the weather. Then it was the transition did not go as seamlessly as Gates and Mullen had promised. Then the admission that Gaddafi had changed tactics and no longer relied on tanks. Or that the tanks were hidden in civilian neighborhoods. Gaddafi forces were using human shields. This came as a surprise? Did NATO honestly not anticipate exactly that? So instead of thinking NATO might be obfuscating, I began to allow that it might just be incompetent. Now the admission is that NATO does not have enough planes. They had announced with pride the addition of new countries with fighter jets. No one bothered to explain which ones would actually be used in air strikes and which ones would just fly over the landscape. It turns out that very few indeed were there to hit Gaddafi’s supply lines or take out his tanks attacking Western Mountain towns, much less attack artillery in the field against Free Libyans. The real question that has not been answered is whether the rules ofÂ engagementÂ changed when NATO took over. The change only has to be subtle. More data before pilots can fire. More restrictions on types of targets. More restrictions on locations of targets. All changes that cost time and lives of civilians on the ground. More ways of tying NATO’s hands which effectively aid Gaddafi’s sons. So where does that leave Libya? My guess is that Turkey would welcome Saif as the new leader. Never mind he has never been elected to anything and doesn’t hold any official position in the government. Never mind he is complicit in the Gaddafi crimes against which the people are struggling. He has been leading for a while. Why else his TV speech the first night in his business suit and menacing glare? He was in charge of the country then. When Gaddafi himself showed up the following night, it was pretty obvious Muammar was so ga-ga, he couldn’t be running the show. With Saif, Turkey will not only keep its lucrative Gaddafi contracts, but also get fat new ones for rebuilding the infrastructure destroyed by US missiles and Gaddafi artillery and tanks. Nice work if you can get it. Plus Turkey gets the UK to sponsor a place in the EU. The key is for the Gaddafi regime to control the oil ports along what I call The Strip: Ras Lanuf, Brega et al. They are currently bombing the oilfields in the south – with no NATO interference, I might add. If Saif & his gang of brothers have the West and the oil, it’s pretty obvious what the future of Free Libya is. Will the UN next establish a little protectorate around Benghazi, a new orphan country the world has to support? A sort of new Gaza Strip? It doesn’t have to turn out that way. Effective NATO action can turn the tide. It’s not too late, but a change in the rules of engagement has to happen very soon. Now go ahead. Tear me apart. Len Carpenter, you are the voice of wisdom… Many people on the Internet are spewing the same crap as Fauz is without really following anything. All I have read here is B.S.Ghaddaffi was attacked for his resources.The guy did for Kibya what the western leaders will never do for their people.Now,European companies are rushing to Tripoli for contracts to ‘rebuild’ Libya.Reconstruction after you have bombed the country in the name of protecting civilians? The so called ‘freedom fighters’ were Qatari soldiers but one thing am sure of is that Libyans will wish Ghaddaffi would come back. blind dumb or deaf? probably all-in-one. It is heartening that NATO has just resolved to strike harder at Gaddafi’s forces, and that France, Britain and the USA have reaffirmed that the Gaddafis’ rule must end. Even Germany has promised to aid the citizens seeking freedom. World support doesn’t seem to be fading or losing interest in this vital cause. A long-term commitment may prove to be more effective at ousting Gaddafi than a massive first-strike. News photos of the official pro-Gaddafi demonstrations seem to show only rugged-looking males of a military or security background but out of uniform, or else hired goons. This suggests that his “popular support” is all bought-and-paid-for, or else blackmailed. If Turkey is seen as supporting Colonel Gaddafi for colonialist reasons, that will not play well in the Arab world or elsewhere. Gaddafi is what the Latin Americans call a “vendepatria,” selling off his country’s resources to foreigners for a huge cut of the profits, at the expense of his people. If Turkey, in their role as NATO’s naval force, allows Gaddafi to do business while blocking support for the freedom fighters, that violates the UN mandate. If Turkey is weakening the military rules of engagement to leave the people at Gaddafi’s mercy, that is a clear UN violation. The long-term danger to the people of Libya is Gaddafi’s crime family. If left in power, they will exact vengeance and worsen the oppression over many years. Gaddafi’s so-called “loyalists” are mainly foreign hired killers and sadists who hold all the Libyans in contempt. The continuing threats and and attacks against the heroic woman Iman Al-Obeidi show this. Gaddafi’s people brutalized her on-camera and are still beating her. World opinion is turning ever more strongly against the regime, and it won’t help Turkey to be on the wrong side, whether in an election or in trying to join the European Union. Oh yeah, Europe is really going to welcome into their EU partnership a country that stands up for the crazy terrorist bomber Gaddafi, LOL! At the moment there seems to be a broad consensus that NATO is doing too little too late. Besides speculations, the plug in NATOs action seems to be located in Turkey. So what is going on in Turkey? Why are the Turks blocking for more NATO attacks? I decided to look into the matter and try to find an answer. – Regional influence and power in the Arab world. Turkey have been actively engaging with Libya for some time. Before the revolution, 20.000 Turkish citizens were working in Libya. Turkey has billions of dollars of investment which it risks losing if the Gaddafi regime falls. Much of the investments are government spending. Turkey is trying to obtain regional influence by stressing humanitarian aid and political solutions instead of military solutions in Libya. They are doing that by sending humanitarian aid to Benghazi and Misratha while leading negotiations to obtain a political solution. The Arab world is against a military solution and therefore itâ€™s not appealing to Turkey to support a military solution. If Turkey succeed the western countries will stand out as aggressors imperialists and oilhunters, while Turkey will be the victors of the conflict. Thereâ€™s only one fault in the plan: Gaddafi. This is a hell of an article, a hell of an argument, very circumstantial and forceful. I’m with you and President Obama in saying the Gaddaffi clan has got to go. England, France, Germany and other NATO powers should all have stronger reasons for this than Turkey has to prolong and stall the struggle.